The Pepco WaterShed Sustainability Center opens to the public following a dedication ceremony for media and other guests on Earth Day, April 22, 2014 at the Pepco Service Center in Rockville, Md. 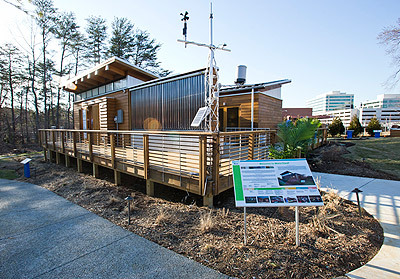 The new WaterShed Sustainability Center includes the energy-efficient house designed and built by students and faculty from the University of Maryland that won first place in the 2011 U.S. Department of Energy Solar Decathlon on the National Mall. Pepco Holdings, Inc. acquired the house in 2012 and worked with the student team to relocate it to the 5,000-square-foot site adjacent to Pepco’s Service Center in Rockville, Md. David M. Velaquez, executive vice president, power delivery ,PHI. WaterShed overcame fierce competition from 19 other international collegiate teams to win the Solar Decathlon. Each team was challenged to design, build, and operate solar-powered houses that are cost-effective, energy-efficient, and attractive. WaterShed runs solely on solar power, but is also constructed to harvest, recycle and reuse water. Unique design elements, such as “manufactured wetlands” that both protect and produce resources, set WaterShed apart in the competition. The 200-member UMD Solar Decathlon Team included students and faculty from the Maryland School of Architecture, Planning and Preservation, the A. James Clark School of Engineering, the College of Agriculture and Natural Resources, the College of Computer, Mathematical, and Natural Sciences, and the University Libraries. In its new home at Pepco, WaterShed will serve as a “living classroom” to demonstrate smart, efficient, clean energy options. The Pepco WaterShed Sustainability Center is open to the public and is a unique outing opportunity for students and educators. Visitors are encouraged to tour the Sustainability Center to see comfortable, sustainable and energy-efficient practices at work. For large groups, please contact Megan Kilgore at Watershed@pepco.com in advance of the visit. The Pepco WaterShed Sustainability Center is located at 201 West Gude Drive in Rockville, Maryland and is open for guided tours Monday through Friday 10 a.m. to 3 p.m.
Pepco, a subsidiary of Pepco Holdings, Inc. (NYSE: POM), delivers safe, reliable and affordable electric service to more than 800,000 customers in Maryland and the District of Columbia.